Seated Liberty Half Dimes - Modeled after the English Britannia. 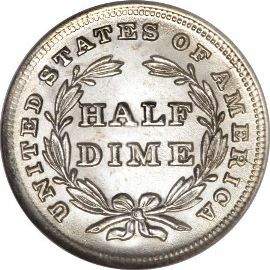 Seated Liberty Half Dimes (no stars variety) were produced between 1837 and 1838. These coins were designed by Christian Gobrecht and modeled after the English Britannia. This particular US Mint issue of half dimes has no stars on the obverse of the coin. 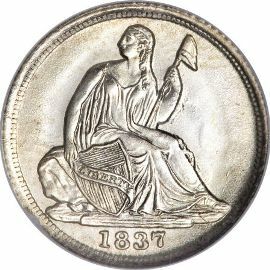 Some people criticized the fact that these silver coins did not have traditional stars signifying the original states, and in 1838 they were added. word "LIBERTY". She is also holding a pole with a Liberty Cap on top of it. The date is inscribed below her as well. The reverse of the coin is simple in design as well; it features a laurel wreath encircling the denomination "HALF DIME". The legend reads "UNITED STATES OF AMERICA" and surrounds the wreath. © Copyright 2008-16 www.your-rare-coin-collecting-guide.com. All Rights Reserved Worldwide. Images courtesy of HA.com and the U. S. Mint.